This is the folio policier paperback edition of People of Darkness published in 1998 by Éditions Gallimard. The French translation is by Jane Fillion and the cover art is by Jack Parsons. 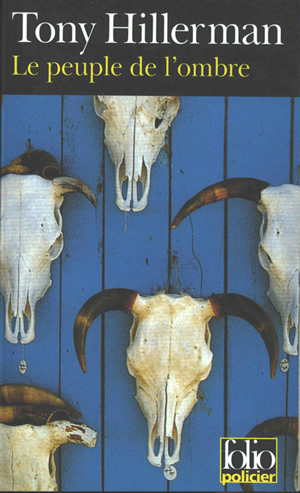 The front cover shows five cow skulls and the horn of one other attached to a turquoise plank wall. The back cover has a brown background with white and yellow printing. The inside front and inside back covers are blank. Binding: Full-color paper covers. On the spine, the author name and book title are printed horizontally bottom to top, with the publisher's logo and series number printed vertically, all on a dark brown background.